CATONSVILLE – In a first for two Archdiocese of Baltimore parishes that share a pastor, parishioners of St. Agnes in Catonsville and St. William of York in Ten Hills gathered March 17 in a Lenten project that packed 20,000 meals for the people of a small, poverty-stricken country of West Africa where hunger is widespread. 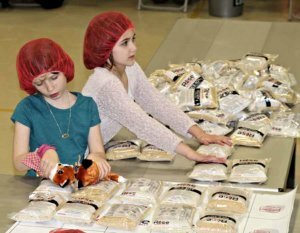 About 150, from toddlers to retirees, spent part of St. Patrick’s Day at the St. Agnes activity center preparing and packing meals that Catholic Relief Services will send to Burkina Faso as part of the CRS Helping Hands project to feed the hungry. “Each meal includes soy, rice and a nutrient enhancement intended to feed a family,” said Scott Hollingsworth, a St. Agnes parishioner who is director of financial planning and analysis for CRS. Dottie Watkins, a fellow St. Agnes parishioner, was delighted. Kathie Jarosinski, a St. William of York parishioner, said it was a great project for families with young kids and a good project for older people. “It was amazing to see everyone working together and enjoying themselves,” she said. Karen Lightner, a St. Agnes parishioner, noted the organization of the event. The buckets contained packets of meals. Each packet had been assembled at one of the tables set up for that purpose and the children were pushing them across the floor to stations where they were packaged into cardboard boxes for shipment. St. William of York parishioner Lauren Kosloski attended with daughters Erin, 18, and Emily, 15, students at Mount de Sales Academy in Catonsville. Lauren and Erin participated in a similar CRS event at the National Catholic Youth Conference in Indianapolis last year. When her daughters learned of the local Lenten event, they signed up the family. “I really enjoyed seeing all the age groups working together and having different jobs to do,” Kosloski said. “I thought the day went great,” said Father Michael Foppiano, pastor of the parishes. “It exceeded our every expectation. People generously volunteered and they want to do it again. You can’t ask for any more than that. The pastor added that the parishes will “definitely” partner with CRS Helping Hands again. “We’re already looking at dates for next Lent,” he said. 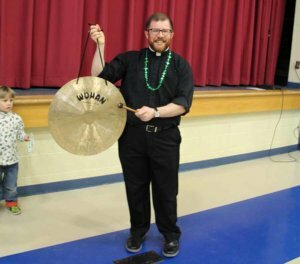 John B. O'Donnell is a resident of Catonsville and a parishioner of St. Agnes in Catonsville where he is a lector and extraordinary minister of holy Communion and serves as the parish liaison with a partner parish in Haiti. John also serves patients at St. Agnes Hospital in Baltimore as an extraordinary minister of holy Communion. He is a graduate of Mount St. Joseph High School in Irvington and worked at The Baltimore Sun as a reporter. 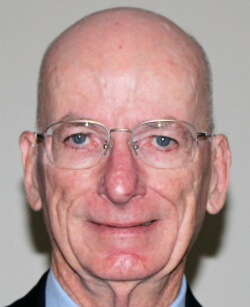 editorial writer and editor for more than 40 years. 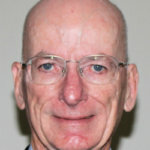 He is a contributor to the Catholic Review.